There’s nothing like learning on the job for actually learning is there! You can read every book you can find in preparation for something but until you are in crisis and what you know (or need to know) matters the information is perhaps lost in the ether. 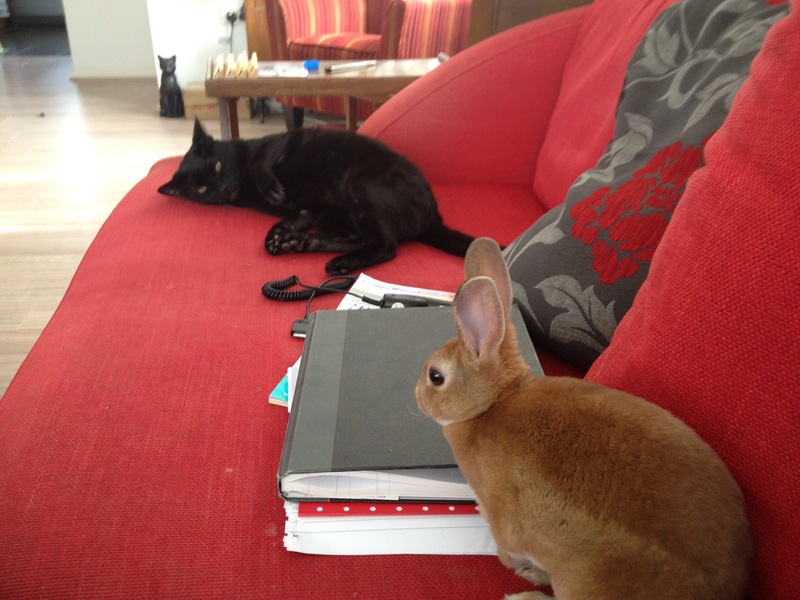 I first met Audrey, my Rex Rabbit, in Pets at Home. She was in the Adoption Centre with a little note saying that she had been bullied by the other rabbits and a bite from one of them had needed to be operated on. She had a little scar and big lonely eyes. We connected. She wasn’t called Audrey then. I named her Audrey when we got home, after Audrey Hepburn. 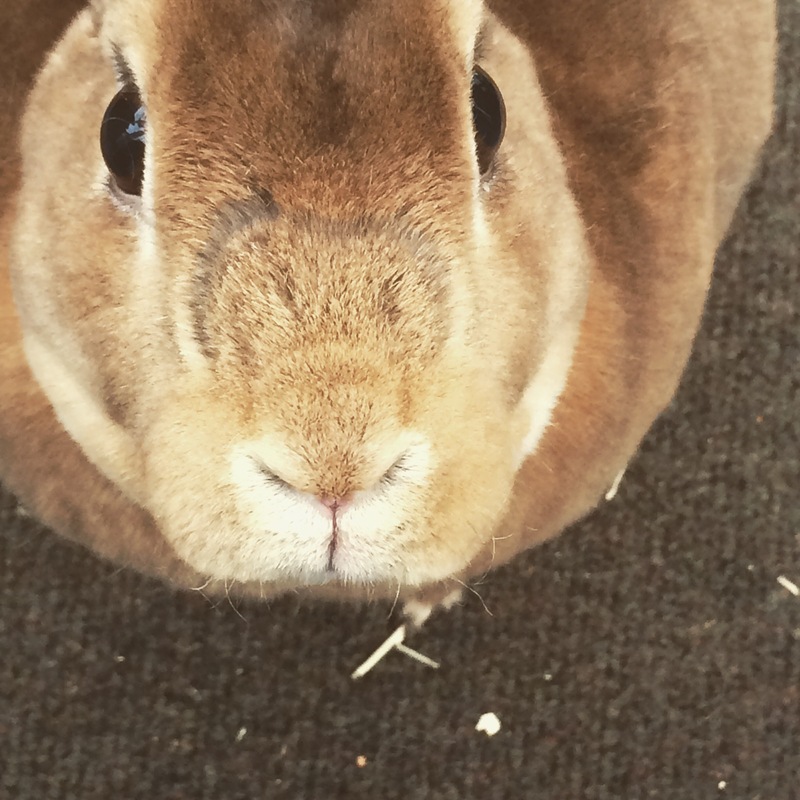 ​I had never yearned for let alone owned a pet rabbit before. I worked with what I knew therefore. 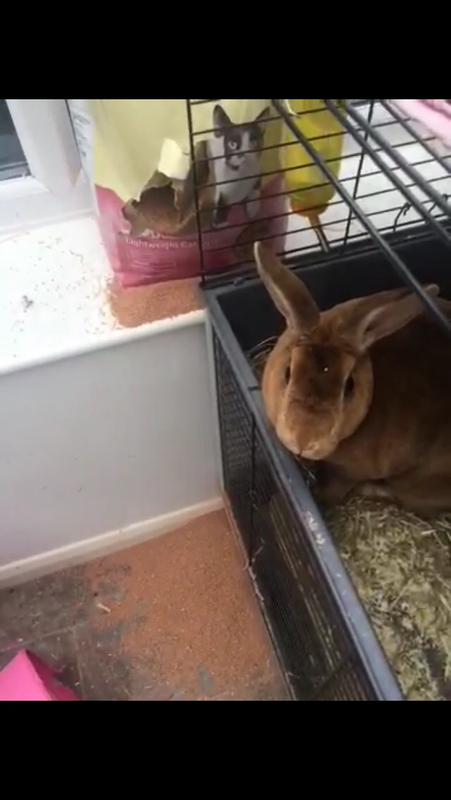 We bought a cage because rabbits live in cages in the garden. 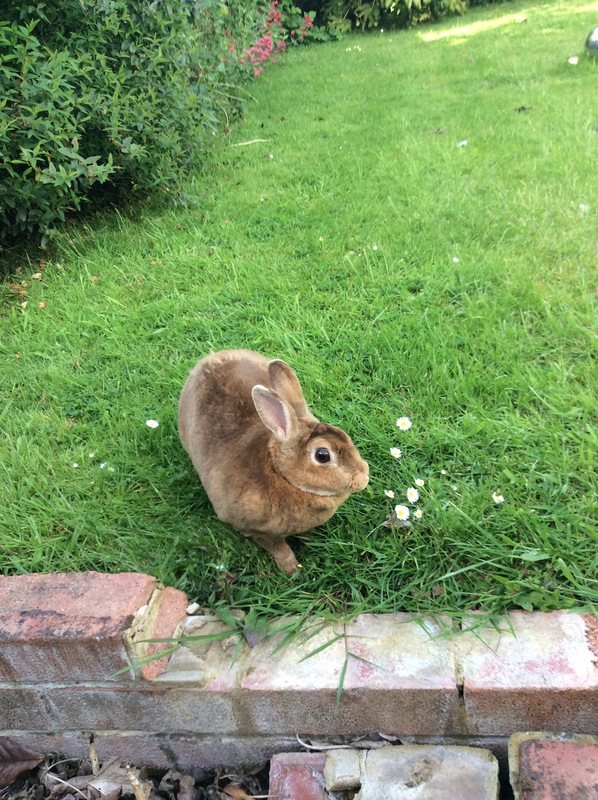 We felt uncomfortable putting her straight in the garden as she had obviously been born and grew up in a shop and didn’t know what outdoors was. So the first night we put her in the garage in her cage. In the morning my husband told me that he thought he had heard her crying during the night. I was sure rabbits didn’t make a noise but I researched it and found that when they’re scared rabbits can make a noise like a crying baby. That afternoon Audrey and her cage moved into the conservatory and there she has lived ever since. I think we are about 4 years in now and it has been a steep learning curve! What I’ve learned from four years of being run by a rabbit! Rabbits are not cuddly. Audrey doesn’t like being picked up. She is her own boss. You may stroke her nose or behind her ears if she deems it a suitable time but otherwise beware. Rabbits are fussy eaters. They particularly like sugary snacks and much as it is a relief to finally feel like she likes you when you give her a treat it is best to try to limit them to avoid obesity. Rabbits bully cats. I have two 16 year old black cats who have lived with us since they were kittens. Audrey is not a welcome addition to the house for them! She stalks them. She is like an irritating little sister that they just want to shake off. But when the chips are down they’ve got her back. 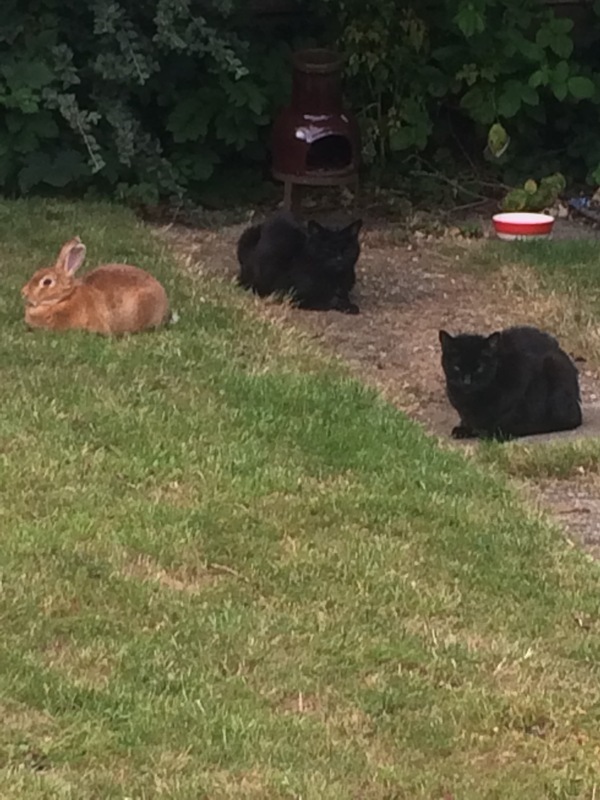 Next doors cat would like to eat Audrey I think but Macavity and Sabrina always chase it out of the garden whilst the rabbit chomps on her grass. Stasis in rabbits is incredibly stressful and over the years I have learned to manage it with her as she is prone to it. The rabbit gut needs to keep moving, eating and pooing, eating and pooing. If either stops then the gut goes into stasis which is fatal to rabbits. I’ve managed to get Audrey on to pellets that contain fibre and have learned that if she eats too many it gets really messy! So she has a spoonful a day which keeps things moving. If we get to stasis, rarely now but we’ve just had an episode, then we use Fibreplex which is a food supplement in a little pen which you inject into their mouths when they’re not eating by choice. I always have one in the cupboard in case of emergencies. A vital bit of kit for rabbit owners! I get mine from Amazon. Rabbits need a plentiful supply of water and hay. Rabbits need space. I’ve gradually relaxed enough to let Audrey have free, supervised, access to our enclosed garden. She loves to binky around (jumping and twisting in happiness) and run full pelt in circles. She is never happier than when she is running around the garden. It is a real joy to watch her. Although time intensive! Rabbits are clever little things. Audrey does like her little box which she gets her treats out of. She likes to kick a ball around. She likes to be entertained otherwise it is a pretty long dull day for her. When she used to live in her cage she worked out how to open the door. I remember the first morning I saw rabbit droppings in the cats litter tray but the rabbit was in her cage. I just could not work out what had gone on! 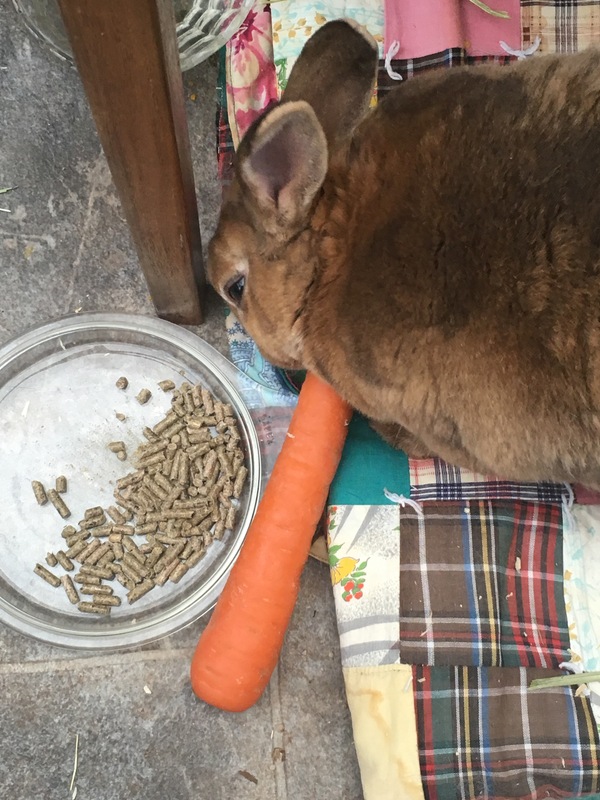 Rabbits will eat literally anything. Carpets. Telephone cables. Books. iPhone charger cables. Computer charger cables. Trust me. I speak from experience. And it’s expensive to replace these things! Audrey has free run of downstairs in our house but such things are now inaccessible to her! She’ll always run upstairs if we forget to block it and then burrow into the carpet again! I love Audrey so much and am glad we get to share her little life with her but oh my is she high maintenance and hard work! Keeping a rabbit is not just about cuddles. It just isn’t about cuddles at all. Rabbits needs love and attention. I know Audrey so well now that I can recognise when she is starting to get ill. Rabbits should be as much a part of the family as dogs and cats are. They are not animals that should be locked in a small cage and left until you can find half an hour to feed them. Rabbits are interesting and interested, are prone to depression and actually need the attention, though they may convince you otherwise! Please don’t get a rabbit because you think it will be easier than a dog or cat. My cats are much easier!